The State of Washington is located in the Pacific Northwest region of the United States of America. It is located north of Oregon, west of Idaho, and south of the Canadian province of British Columbia. The state has an area of 71,342 square miles (184,827 km²). 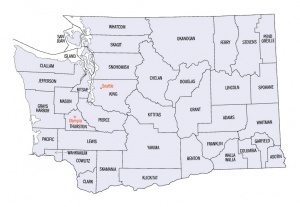 Washington's population in 2012 was 6,897,012, with over half living in the Seattle metropolitan area. Archaeological evidence suggests that the area was one of the first populated areas in North America. The area that is now Washington state was originally inhabited by various Native American tribes, including the Chinook, Lummi, Quinault, Makah, Quileute, and Snohomish along the coast and the Cayuse, Nez Percé, Okanogan, Palouse, Spokane, Wenatchee, and Yakima in the interior. The first European settlers arrived in 1775 and the area was claimed by Great Britain in 1811. Joint occupancy between Great Britain and the United States was established in 1818, and the area was highly contested by both countries until the Oregon Treaty was signed in 1846. The region was part of the Oregon Territory from 1848 until 1853, when it was separated from Oregon and became known as Washington Territory. Washington became the 42nd state of the United States in 1889. Washington is a leading producer of lumber products and also produces a number of fruits and vegetables. Manufacturing includes the design and manufacture of aircraft, automotive, and computer software development. In 2010 the ethnic composition of Washington was as follows: White: 77.3% (Non-Hispanic Whites 72.5%, White Hispanics 4.8%); Black or African American: 3.6%; Native Americans: 1.5%; Asian: 7.2% (1.4% Chinese, 1.4% Filipino, 1.0% Vietnamese, 0.9% Korean, 0.9% Indian, 0.5% Japanese, 0.3% Cambodian, 0.1% Laotian, 0.1% Thai); Pacific Islander: 0.6% (0.2% Samoan, 0.1% Guamanian, 0.1% Hawaiian); Two or more races: 4.7%; Some other race 5.1%. In 2009 the following ancestry groups were recorded in the state: 20.7% German; 12.6% Irish; 12.3% English; 8.2% Hispanic; 6.2% Norwegian; 3.9% French; 3.9% American; 3.8% Swedish; 3.6% Italian; 3.3% Scottish; 2.5% Scotch Irish; 2.5% Dutch; 1.9% Polish; and 1.8-2.0% Russian. In 2001, 42% of the state's residents stated that someone in their household was affiliated with a church or other religious establishment. The major religious affiliations were: Protestant: 49% (Evangelical: 25%; Mainline: 23%; Other Protestant: 1%); Unaffiliated: 25%; Catholic: 16%; Latter-day Saint: 2%; Jewish: 1%; Muslim: 1%; other religions 3%. The percentage of non-religious people in Washington is higher than any other state other than Colorado. Mennonites in Washington, Oregon, Idaho and Montana, 1950s. Source: Mennonite Encyclopedia, v. 4, p. 893. The first Mennonites to settle in Washington came to Whiteman County in 1886, from Pulaski, Iowa. In 1893 these early settlers organized what is now the Onecho Mennonite Church. In 1900 a congregation, formerly from Freeman, South Dakota, moved to Adams County from Lane County, Oregon, and is now the Menno Mennonite Church. In 1918 the First Mennonite Church of Monroe was organized by settlers from Pretty Prairie, Kansas, and Corn, Oklahoma. The Newport Mennonite Church, known as Spring Valley, was organized in 1928 by settlers who began coming to this area in 1922. In 1944 the Mennonite Country Church east of Monroe was organized, and in 1945 the Glendale Mennonite Church of Lynden. The last congregation to be established in the 1950s was Warden. There were thus seven General Conference Mennonite churches in the state. The one Mennonite Brethren (MB) church in Washington is the Whitehorn MB Church, near Blaine, which was organized in 1937. Congregational adherents include all full members, their children, and others who regularly attend services. ARDA: The Association of Religion Data Archives. "State Membership Report: Washington, Religious Traditions, 2010." Web. 26 December 2013. http://www.thearda.com/rcms2010/r/s/53/rcms2010_53_state_name_2010.asp. Burkholder, H. D. The Story of Our Conference and Churches. North Newton: Mennonite Press, 1951: 22-36. Hertzler, Daniel. From Germantown to Steinbach. Scottdale, PA: Herald Press, 1981: 173-185. Horsch, James E., ed. Mennonite Yearbook and Directory. Scottdale: Mennonite Publishing House (1986­87): 45, 83, 102. Lind, Hope Kauffman. 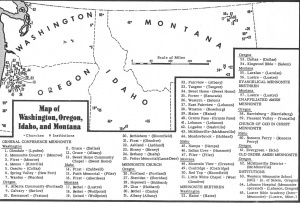 Apart & together : Mennonites in Oregon and neighboring states, 1876-1976. Scottdale, PA: Herald Press, 1990. Pacific Coast Conference (MC), Annual Report, (1986): 9. Pacific District Conference (GCM), Annual Report, (1986): 12-13. Wikipedia. "History of Washington (state)." 4 December 2013. Web. 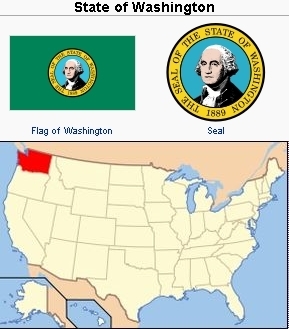 26 December 2013. https://en.wikipedia.org/wiki/History_of_Washington_(state). Wikipedia. "Washington (state)." 25 December 2013. Web. 26 December 2013. https://en.wikipedia.org/wiki/Washington_(state). Wiebe, Willard W. and Hope Kauffman Lind. "Washington (USA)." Global Anabaptist Mennonite Encyclopedia Online. 1989. Web. 21 Apr 2019. http://gameo.org/index.php?title=Washington_(USA)&oldid=134961. Wiebe, Willard W. and Hope Kauffman Lind. (1989). Washington (USA). Global Anabaptist Mennonite Encyclopedia Online. Retrieved 21 April 2019, from http://gameo.org/index.php?title=Washington_(USA)&oldid=134961. Adapted by permission of Herald Press, Harrisonburg, Virginia, from Mennonite Encyclopedia, Vol. 4, pp. 892-893; vol. 5, p. 921. All rights reserved. This page was last modified on 12 July 2016, at 16:38.